I’m so excited for you guys to see years of brainstorming and months of hard work come to fruition. 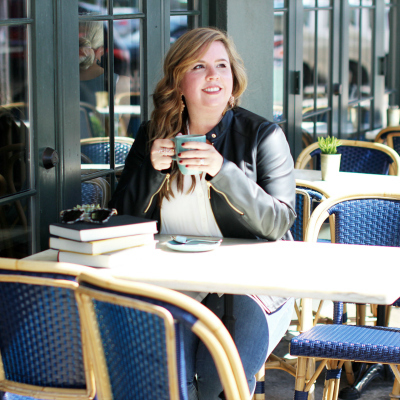 My goal with the blog is to deliver content that is valuable and authentic, offer tips to motivate and inspire you, and share my own personal slice of life as a way to relate and learn from each other. Today is only the beginning. Big features will be shown in the slider and in the six squares at the top of the page. That’s your most recent refreshed content and a great place to start. Scrolling down, you’ll see some book highlights from what I’m reading now to THE WEEKLY EDIT—an easy-to-read post on all things book related and more. You’ll also see my latest recommendations, and further down on the page, the CRUSHING ON area shows you some items I’m currently obsessed about! If you’re looking for all the book content on one page, by category, click EVERYTHING BOOKS in the top menu. There, you’ll find reviews, upcoming releases, sales, favorites and so much more. You can also click the BOOKS category page under my name, which will give you a view of the latest book-related posts ordered by date published. Make sure to take special note of THE WEEKLY EDIT (the new VBB Weekly) which has gotten a major makeover! And don’t forget to check out the BOOK RECOMMENDATIONS BY CATEGORY page, which will help you find your next favorite read, whatever your mood is! My goal with this content is to share styles that will fit every body (and curve). From fashion trends, to shoes, to tips and inspiration on putting together outfits for every occasion, I’ve got you! So much more is coming in this section, and I’m so excited to partner with other fashion influencers as a part of this launch and more so in the future. Click the STYLE category page under my name to see the latest content. I’ve always loved home decor and I know we’ll have so much fun in this section! I’ll be posting tips and how to’s as well as inspiration from my own home, all with affordability and ease in mind. I’m especially thrilled to jump into holiday content here… it’s going to be amazing. Just click HOME under my name to get started. If you love makeup and skincare, this is the area for you. I’ve got friends and influencers sharing their makeup must-haves over the next months, plus the latest in skincare and more. Again, more to come, but for now, click BEAUTY to see the latest. This section is what I’m most excited to develop! I’ll cover a wide range of topics from working moms to women leaders, from fitness to food, to even blogging and social media. The goal is inspiration, to help us get motivated to not only survive each day and each challenge, but do so with confidence and without stress. Click LIFE to go see the newest posts. Again, thank you for your support and enjoy the new site! I love the new website, Vilma!! Looks fantastic. I’m excited for you and everything you’ll be sharing with us! Found your site through rock chick nation 😉 So happy to have a fun new read! Yes! A fellow Rock Chick! Thank you!